On Friday, I had my 7th grade class for 90 minutes before the Holiday Assembly. Needless to say, I was a bit intimidated by the challenge of keeping them engaged without turning into a Grinch about the whole thing. I wanted it to be fun, but I also didn’t want to waste the time. It seemed like a very long time, when all of the focus was going to be on getting out and away from school. The class started with them taking a quick quiz, one that we had been preparing for all week. I had created a 30 question multiple choice quiz on our Haiku site and set it so that they could take it up to 10 times. For the first nine times, they had two chances to get the correct answer. We had worked on it together, and they had studied in pairs and alone. Each time they had taken it, they got better and better, clearly enthusiastic about their increasing mastery of the material. On Friday, the vast majority of the class got 100%, which was an upbeat start to the day. I then presented them with a challenge for the day – to create the best map of Africa that they could in 70 minutes. I told them that they had the freedom to decide what “best” meant for their map. I sort of held my breathe as I introduced it, because I wasn’t sure if it would catch their interest or imagination. If it didn’t, it was going to be a long 90 minutes of playing Geography games. Luckily, one girl, just as I finished introducing it and saying that there would be prizes, said, “Hey, that sounds like fun!” Quick internal sigh of relief on my part! I gave each group a Tabletop Mapmaker set from National Geographic. It was a map of Africa, printed on nine sheets of paper that can be taped together to make the larger map. (If you haven’t tried these, they are a fabulous was to kick off a unit or work on geography.) I then gave them atlases and told them that they could use their laptops as well for research and ideas. I reminded them about where the scissors, tape, colored pencils and markers were and then let them lose. I also told them that they could listen to music if they kept it low, also something that I don’t usually do, but it was almost Break! What happened next was 70 minutes of cheerful and engaged work! They explored and shared their ideas, each group seeking to come up with new ways to show what they had found about Africa. 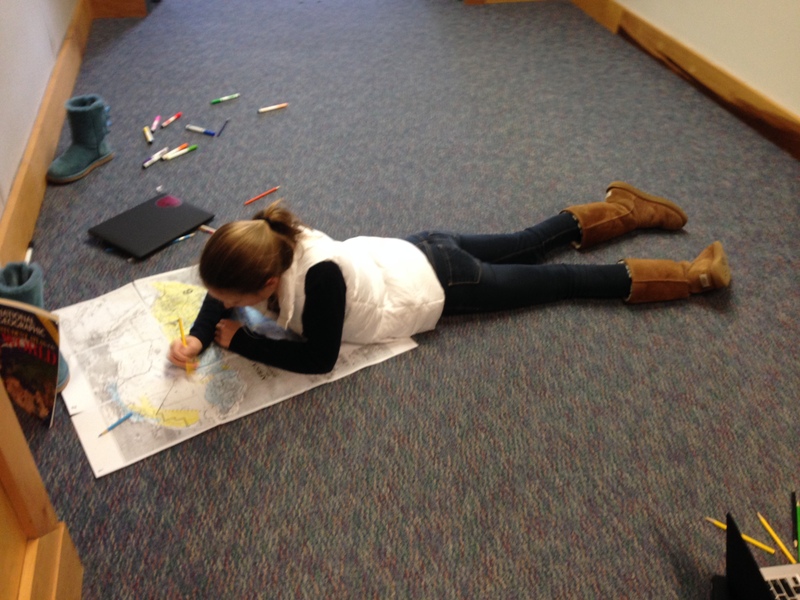 Some started with taping the map together while others began by coloring individual pages. Some focused on showing the different countries, coloring them as they were on a political map. One group decided to show rainfall and population to show the correlation between them. Another focused on agriculture. At one point, as I was walking around the room, a student who can be resistant to doing the work of the class, asked me why they were doing this activity. She was clearly enjoying it but was just used to asking the question. 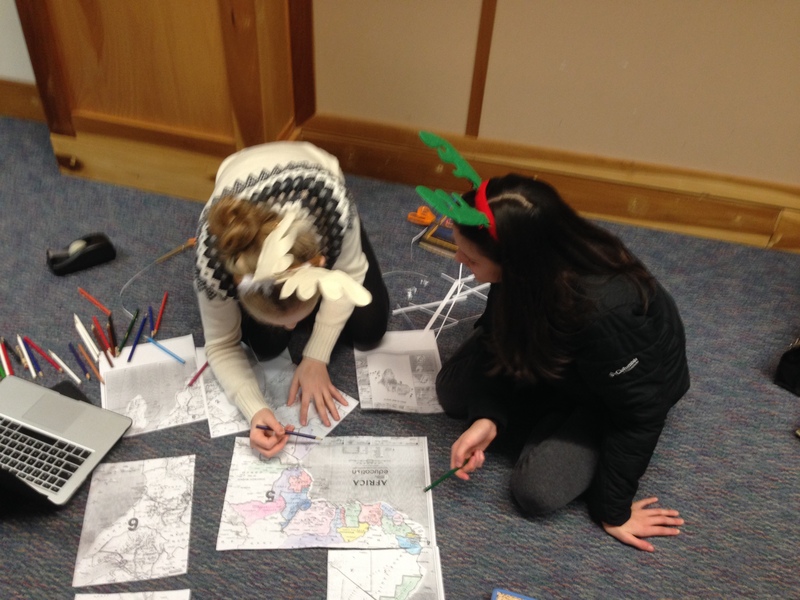 I explained that with 90 minutes on the last day before Winter Break, I wanted them to be learning but also having fun and that working with maps seemed like a good way to do that. Her response totally amazed me! Made my day! If on some level, she can begin to understand that what happens in the classroom has a goal of helping her learn and grow, then we have taken a step forward! While they were working, I created a Google Form. At the end of the period, they voted, with each student getting two votes – one for her work and one for another map. It was very close but the map with the precipitation and population won. We made it to Winter Break with laughter and learning! I had fun watching them and talking to them about what they were doing, and they had fun working together and taking on the challenge! Now it’s time for some rest and renewal! Happy Break to all! Badges are one of those tools that I have liked as an idea, but I have never found the right time or place to put them into my classes. This last week, I decided to give them a time, mostly as a last resort! I had been having a sense of losing control and needed something other than a stern voice to regain the momentum and energy in the class. It seemed like a disease had attacked all of my classes with endless streams of questions. All of the classroom management strategies that I had put into place seemed to have been washed away during the break time. I will admit that my initial response was to answer one after another, repeating myself and acting as if they were all legitimate queries. My classroom is a place of learning, so of course I want to make sure every student feels secure. The next reaction was to feel irritated. I just wanted them to listen to me! Isn’t it their job to be quiet and do what I say? No, of course not, but still couldn’t they just pay attention for a few minutes? Luckily, I have been down this road before, and while that reaction wasn’t great, it quickly led me to acknowledge that if what I am doing isn’t working, it is time to regroup. What could I do to re-engage them in their learning? What strategy was needed to shift the power to them, to make them think before they shouted out questions that they could figure out if they wanted to do it? That’s when I thought about badges. Was there a badge that I could make to challenge them to think before they asked a question, to consider if they could figure it out themselves. Questions, legitimate “I really can’t figure this out” questions are great; the “Make it easy for me so I don’t need to think” ones are not. I went to Credly, made an account and connected it to my classroom Haiku sites. I called the badge Figure It Out, putting a figure of Atlas holding the world on it to encourage strength and self-reliance. The next day, I introduced the badge to my classes. I explained that for each time they were tempted to call out a question, the goal was to pause for 3 seconds. We counted out 3 seconds together to give them a sense of the time. If they still didn’t have the answer, then they could raise their hand. If they figured it out in that time, they were to give me a small fist pump to let me know that they had had success and then record it. I handed out sheets of paper that had the badge at the top and ten lines. We had a good conversation, making some goals for asking questions. They were easily able to identify why I had made the badge, laughing when I asked them if they knew what I was talking about. They really loved the idea of the badge and of being in charge of giving themselves the points. I told them that this was between them and their thinking. I can’t get into their minds and know when they are wrestling with some confusion. They have to do that themselves. It is all on an honor system, but they understood that and were excited to take on the challenge. In the last week, the interesting effect hasn’t been lots of students recording that they figured it out. It has been them policing each other. “You’re not going to get a badge that way!” being my favorite.